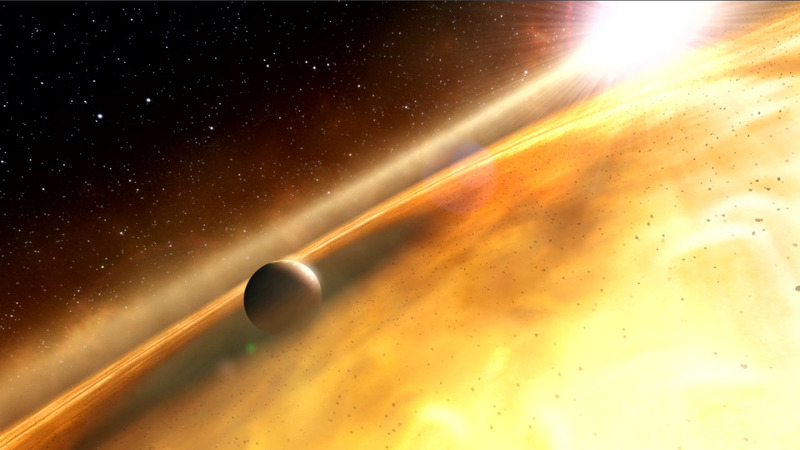 A team of astronomers reanalyzed data from NASA’s Hubble Space Telescope to further examine whether the star Fomalhaut hosts a massive exoplanet, named Fomalhaut b, or to see if it is a short-lived dust cloud unrelated to any planet. A second look at data from NASA’s Hubble Space Telescope is reanimating the claim that the nearby star Fomalhaut hosts a massive exoplanet. 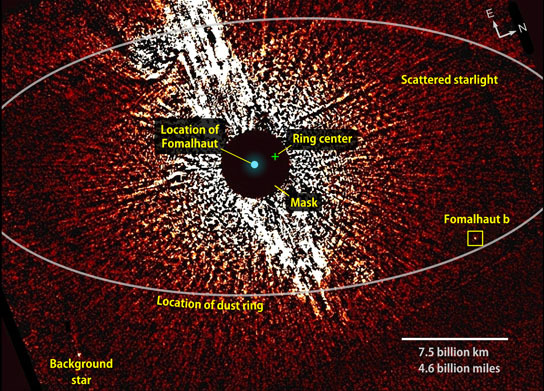 The study suggests that the planet, named Fomalhaut b, is a rare and possibly unique object that is completely shrouded by dust. Fomalhaut is the brightest star in the constellation Piscis Austrinus and lies 25 light-years away. In November 2008, Hubble astronomers announced the exoplanet, named Fomalhaut b, as the first one ever directly imaged in visible light around another star. The object was imaged just inside a vast ring of debris surrounding but offset from the host star. The planet’s location and mass — no more than three times Jupiter’s — seemed just right for its gravity to explain the ring’s appearance. Recent studies have claimed that this planetary interpretation is incorrect. Based on the object’s apparent motion and the lack of an infrared detection by NASA’s Spitzer Space Telescope, they argue that the object is a short-lived dust cloud unrelated to any planet. A new analysis, however, brings the planet conclusion back to life. “Although our results seriously challenge the original discovery paper, they do so in a way that actually makes the object’s interpretation much cleaner and leaves intact the core conclusion, that Fomalhaut b is indeed a massive planet,” said Thayne Currie, an astronomer formerly at NASA’s Goddard Space Flight Center in Greenbelt, Md., and now at the University of Toronto. The discovery study reported that Fomalhaut b’s brightness varied by about a factor of two and cited this as evidence that the planet was accreting gas. Follow-up studies then interpreted this variability as evidence that the object actually was a transient dust cloud instead. In the new study, Currie and his team reanalyzed Hubble observations of the star from 2004 and 2006. They easily recovered the planet in observations taken at visible wavelengths near 600 and 800 nanometers, and made a new detection in violet light near 400 nanometers. In contrast to the earlier research, the team found that the planet remained at constant brightness. The team attempted to detect Fomalhaut b in the infrared using the Subaru Telescope in Hawaii, but was unable to do so. The non-detections with Subaru and Spitzer imply that Fomalhaut b must have less than twice the mass of Jupiter. Another contentious issue has been the object’s orbit. If Fomalhaut b is responsible for the ring’s offset and sharp interior edge, then it must follow an orbit aligned with the ring and must now be moving at its slowest speed. The speed implied by the original study appeared to be too fast. Additionally, some researchers argued that Fomalhaut b follows a tilted orbit that passes through the ring plane. Using the Hubble data, Currie’s team established that Fomalhaut b is moving with a speed and direction consistent with the original idea that the planet’s gravity is modifying the ring. “What we’ve seen from our analysis is that the object’s minimum distance from the disk has hardly changed at all in two years, which is a good sign that it’s in a nice ring-sculpting orbit,” explained Timothy Rodigas, a graduate student in the University of Arizona and a member of the team. Currie’s team also addressed studies that interpret Fomalhaut b as a compact dust cloud not gravitationally bound to a planet. Near Fomalhaut’s ring, orbital dynamics would spread out or completely dissipate such a cloud in as little as 60,000 years. The dust grains experience additional forces, which operate on much faster timescales, as they interact with the star’s light. “Given what we know about the behavior of dust and the environment where the planet is located, we think that we’re seeing a planetary object that is completely embedded in dust rather than a free-floating dust cloud,” said team member John Debes, an astronomer at the Space Telescope Science Institute in Baltimore, Md. A paper describing the findings has been accepted for publication in The Astrophysical Journal Letters. 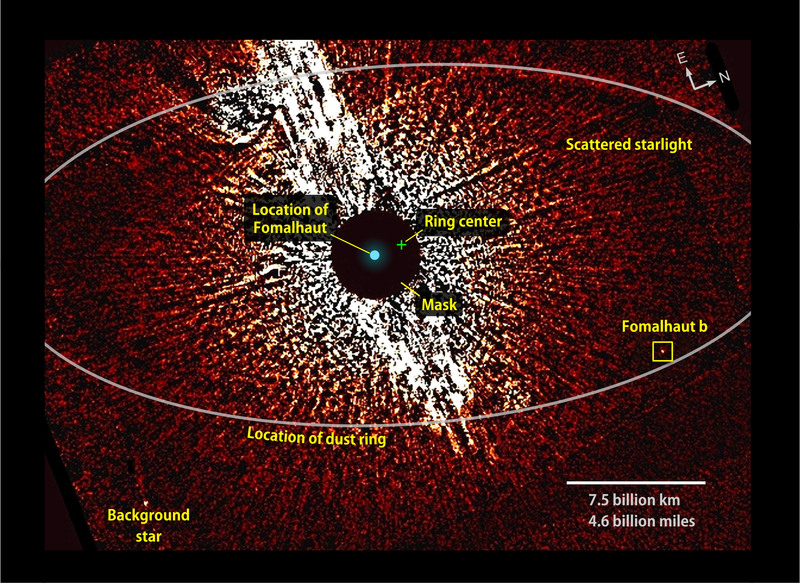 Fomalhaut was targeted with Hubble most recently in May by another team. Those observations are currently under scientific analysis and are expected to be published soon. Be the first to comment on "New Study Revives Doubted Exoplanet Fomalhaut b"